Here’s a useful tip on how to search for files of a single folder and not the subfolders. There’s only one thing you need to pay attention to: where are you searching from? >> Searching from the Libraries? >> Searching from the actual folder’s location? IgorWare Hasher is a free portable SHA-1, MD5 and CRC32 hash generator for Windows. 64bit and 32bit versions available too! Show some love and check out his cool stuff! First step getting Windows 10 is to either be running Windows 7 or Windows 8.1. Since I went directly from Windows XP Pro to Windows 8 Pro, I had to upgrade to 8.1 first. For those of you who prefer doing “clean installs” (I’m one of those, though I won’t this time), see references to download the Windows 10 media. Had to uninstall printer software/drivers and re-install after the update. Had to re-install/upgrade my Comodo Firewall and doing so, lost all my firewall settings. That’s normal since the system changed, thus everything is a “new” application. I now have to re-authorize applications as I go. I’ll be back to normal in a day or two. The Windows lock screen picture changed back to the default image. Mine used to be the one with Seattle’s Space Needle tower. Again, super easy to change. I lost my Windows “run” history (shortcut: Windows Key + R). Not a big deal, but still worth mentioning. 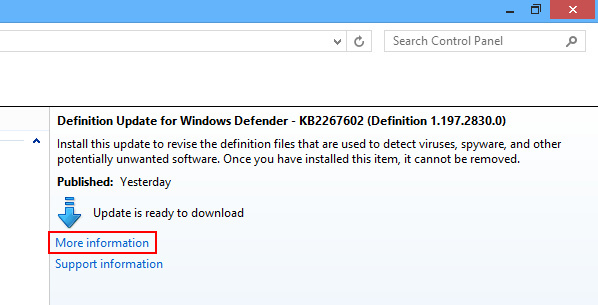 Windows Defender stopped working, but after some updates, it finally got back to normal. NOTE : Always have an antivirus, anti-spyware and backup solution. Everything else! All my production software (GIMP, Blender, Unity3D, etc.) and games (Steam, Battle.net, etc.) are working perfectly. If you don’t like your Windows, please, let me know! I’m sure I can help you. I know frustrated users (often, myself) usually have good reasons to be. But once you understand things, it becomes JOY. If you did ask me for help and still hate Windows, there’s more I can do for ‘ya! Bring some rope, quick-setting cement, a sleeping bag and we’ll be good to go. Because you readers are soo cool, I asked AOMEI for promo codes! 30% off Professional Edition and 20% off Server Edition! So if you installed this update and have the same problem, simply uninstall the update, change search provider and re-install it. On the same topic, always read updates description. Before applying any updates on a system, make sure you know what you’re installing! Yes, it’s an extra click and takes a few more minutes, but more than often, you’ll find “recommended” updates that may not even apply to your situation. Windows 8.1 Installation Media is Free! If you’ve lost, can’t find or don’t even have your Windows 8.1 installation disk (any version btw), there’s now no need to buy a new one; you can create one for FREE! I was recently asked again where to get a new installation media (aka install disk) and thought it was worth a post to reiterate this very useful info. All you gotta do is download Microsoft’s application (less than 2 Mb), run the tool, select the Windows 8.1 version you need. Probably the best part is it lets you choose between a USB installer and an ISO file. Once you’ve picked your preferred method of destruction installing, let it work. It’s that simple! You don’t even have to install anything on your precious computer since it’s a standalone app; which makes it portable too!